This low-carb vegetable is prized for its versatility. In this ultimate guide, learn how to prep and cut cauliflower and cook it up in the oven, microwave or on the stove. 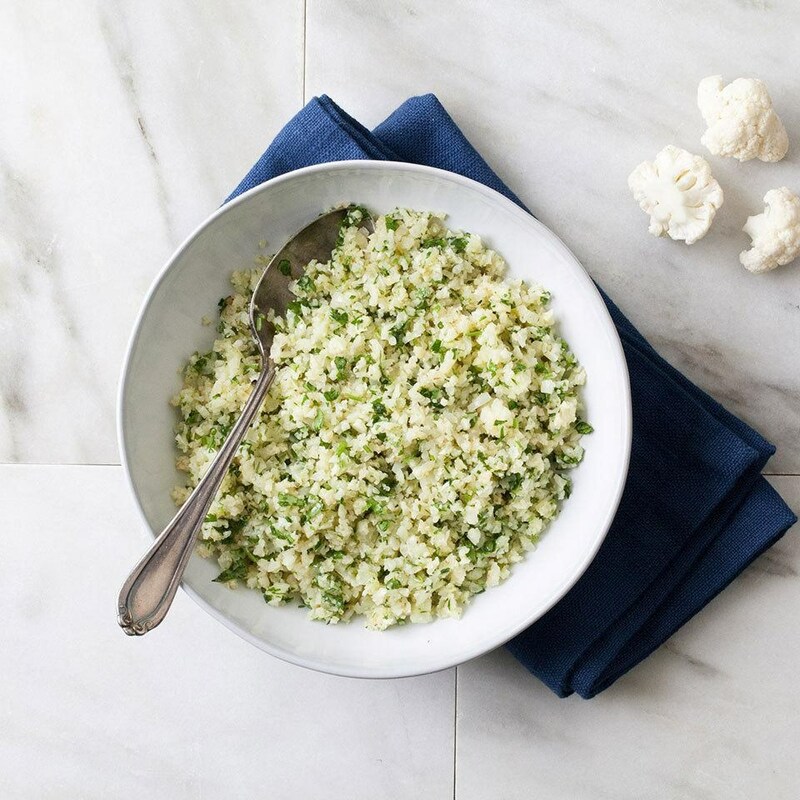 Plus, how to make cauliflower rice. 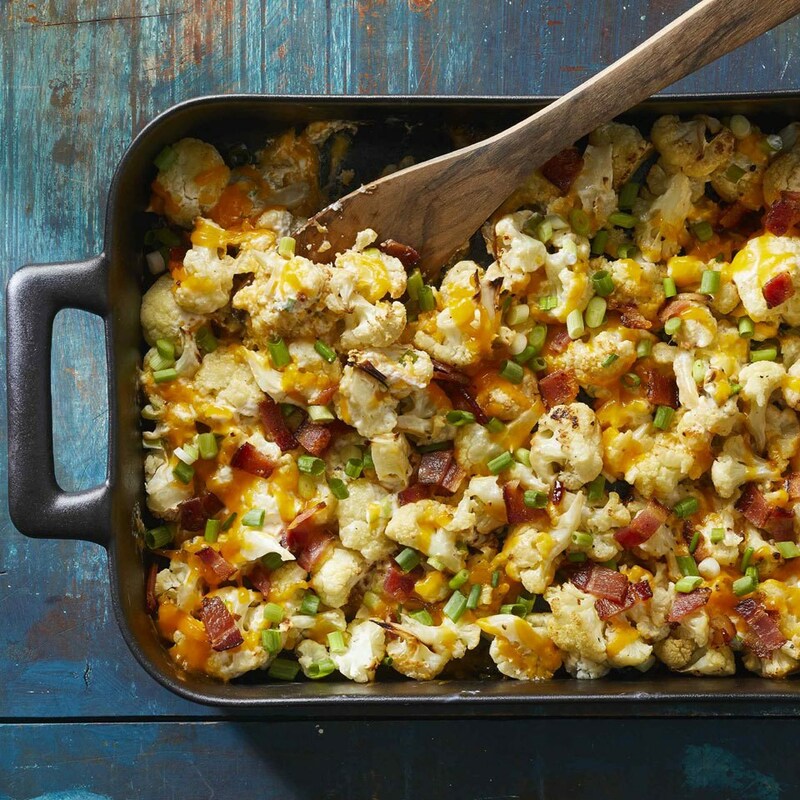 Cauliflower is a healthy-eating golden child. It's incredibly versatile (cauliflower rice, anyone? ), maintains a relatively neutral flavor and is quick to cook via several methods. Cauliflower can be enjoyed raw on crudité platters. It also makes a quick side with just a simple sauté. Try cauliflower as a low-carb swap for mashed potatoes, rice, English muffins or even to make cauliflower gnocchi. Use it as a meatless swap for chicken or steak. You can even roast the cauliflower whole. 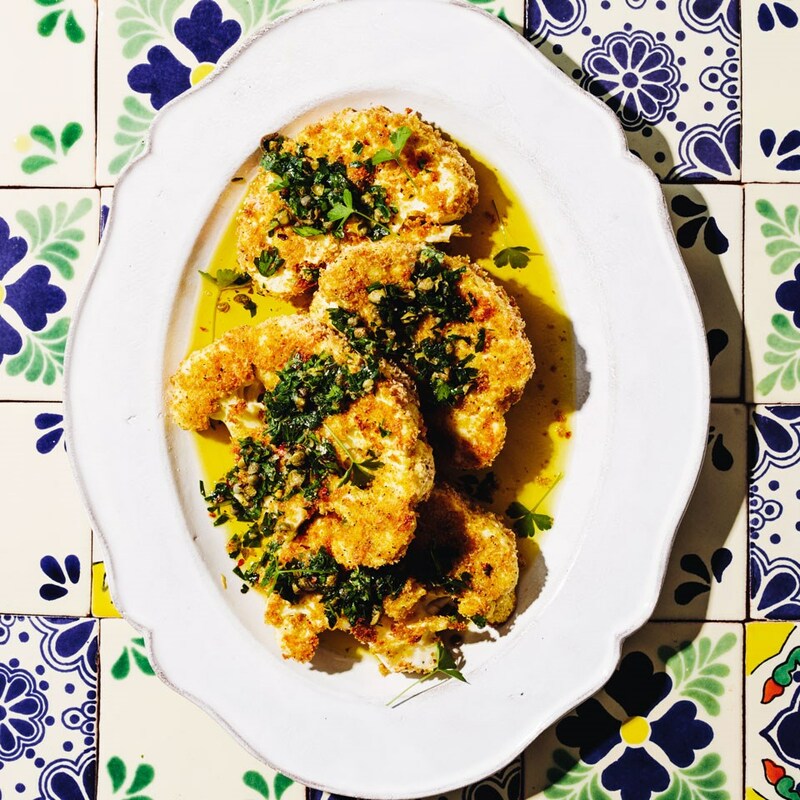 This is your one-stop guide for how to shop for and store cauliflower, delicious ways to cook it, and why it's so good for you. When you're ready to cook cauliflower, you need to take a few steps before putting it into the pan, pot or processor. Using a chef's knife, slice off the leaves from the base of the cauliflower head. 2. Cut off the stem. If you're planning to roast the cauliflower whole or slice it into steaks, slice off the thick stem at the base. Drop the whole cauliflower head upside-down into cool, salted water. Let it soak for 10 to 15 minutes to remove dirt, residue and bugs. Drain and rinse. If you're cutting the cauliflower into florets, turn the head upside-down and, holding the knife at a 45-degree angle, slice around the stem in a circular motion to remove the core from the center. 3. Cut the head into large florets. Using your knife, cut the cauliflower into large florets, removing any leaves or pieces of stem as you go. 4. Trim florets to desired sizes. Slice or break the florets into desired-size pieces. Rinse in a colander under cool running water. Drain and pat dry. Cauliflower leaves and stems can be eaten, especially if they're fresh. (Avoid the very end of the stem, which is often dry and woody.) The stems can be shaved into thin pieces and used in a salad or sautéed in stir-fries. Use both leaves and stems in place of spinach, broccoli greens or other bitter greens. Cauliflower can be cooked with just about any method you can imagine, from the grill to the braising pan. Its flavor is incredibly versatile, so you can add a multitude of spices to meet the variety of dish you're seeking. Slice it into slabs and give it a high-heat sear as a "steak." Rice it in a food processor and use it in place of carb-rich rice or other grains. Cut it into bite-size pieces and roast it for a meat substitute. 1. Cut or break cauliflower into medium-size florets. 2. Pulse the florets in a food processor into rice-size pieces. If you do not have a food processor, you can grate a whole raw cauliflower head using a box grater. 1. Combine cauliflower florets with oil and seasoning in a medium bowl. Toss to coat. 2. Pour onto a rimmed baking sheet coated with cooking spray. Arrange in a single layer. 3. Bake at 425°F until browned and crisp, 20 to 30 minutes. 1. Place cauliflower florets in a large microwave-safe bowl. Add enough water to cover the bottom of the bowl. 2. Cover the bowl loosely with plastic wrap, wax paper or a wet towel. 3. Cook on High until tender-crisp, 4 to 5 minutes. 4. Drain the cauliflower and season as desired. Steaming cauliflower is a quick way to turn the crispy vegetable tender so you can blend it into a puree for soup or mash it for a potato substitute. 1. Bring 1 inch of water to a boil in a large saucepan. Place a steamer basket in the bottom of the pan, being sure the water isn't higher than the bottom of the basket. 2. Add cauliflower florets to the steamer. Cover and steam until tender-crisp, 4 to 8 minutes. 3. Remove the cauliflower from the basket and season with oil and preferred seasoning. You can also steam a whole cauliflower. It's a fast way to tenderize the vegetable if you're planning to bake it. 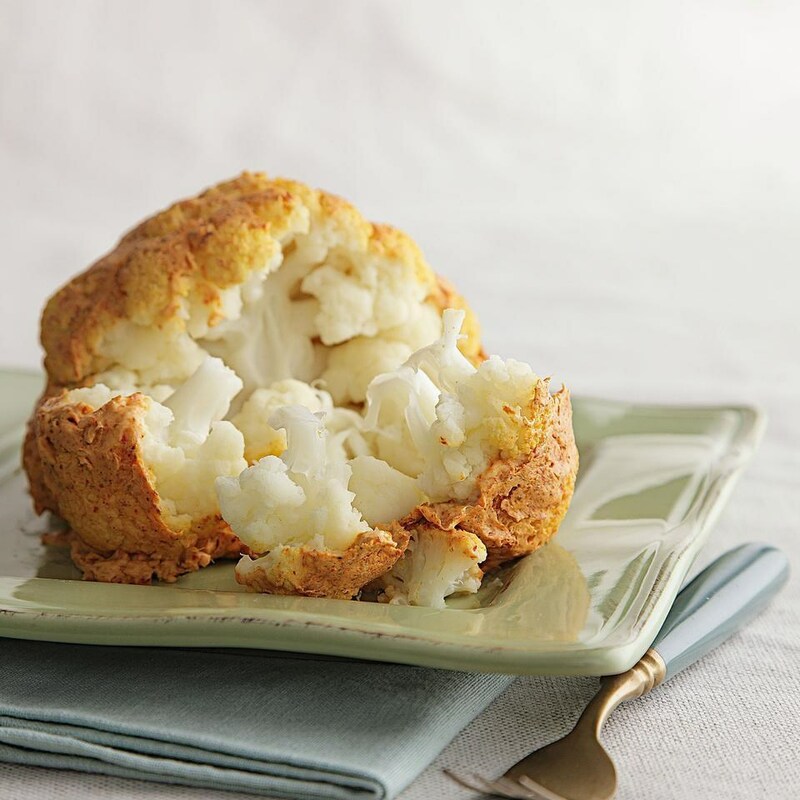 Instead of breaking or cutting the cauliflower into florets, place the whole cauliflower in a steamer basket. Cover and steam to the desired texture, about 15 minutes. 1. Steam or microwave 8 cups cauliflower florets and 4 crushed garlic cloves until very tender. 2. Place the cooked cauliflower and garlic in a food processor with 1/3 cup buttermilk, 2 teaspoons olive oil, 1 teaspoon butter, 1/2 teaspoon salt and pepper to taste. Pulse several times, then process until smooth and creamy. 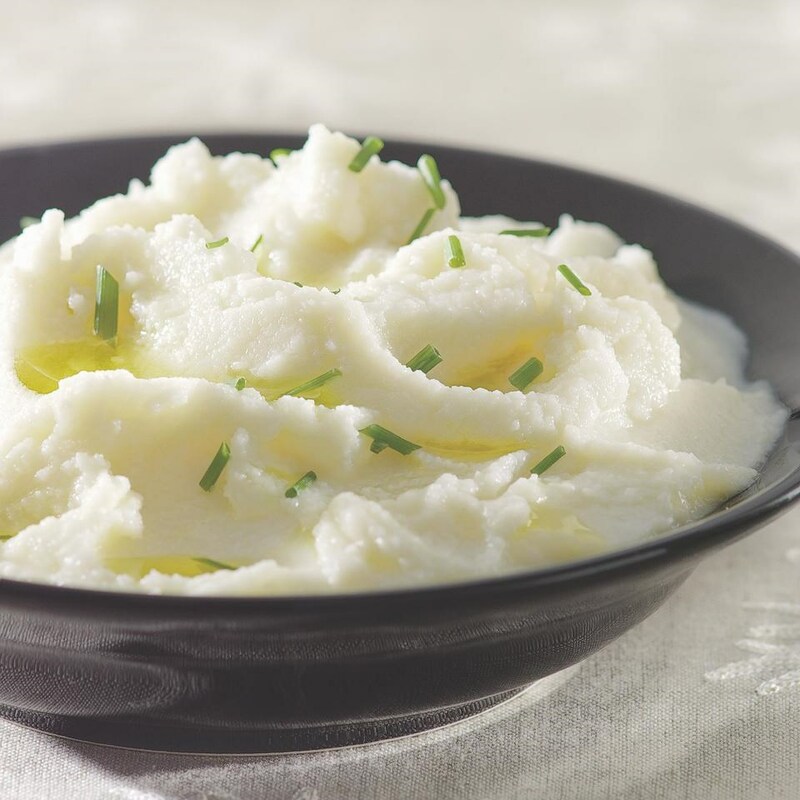 For vegan mashed cauliflower, use olive oil instead of the buttermilk and butter. 1. Heat 1 tablespoon oil in a medium skillet over medium-high heat. 2. Add cauliflower florets and sauté until golden and soft. 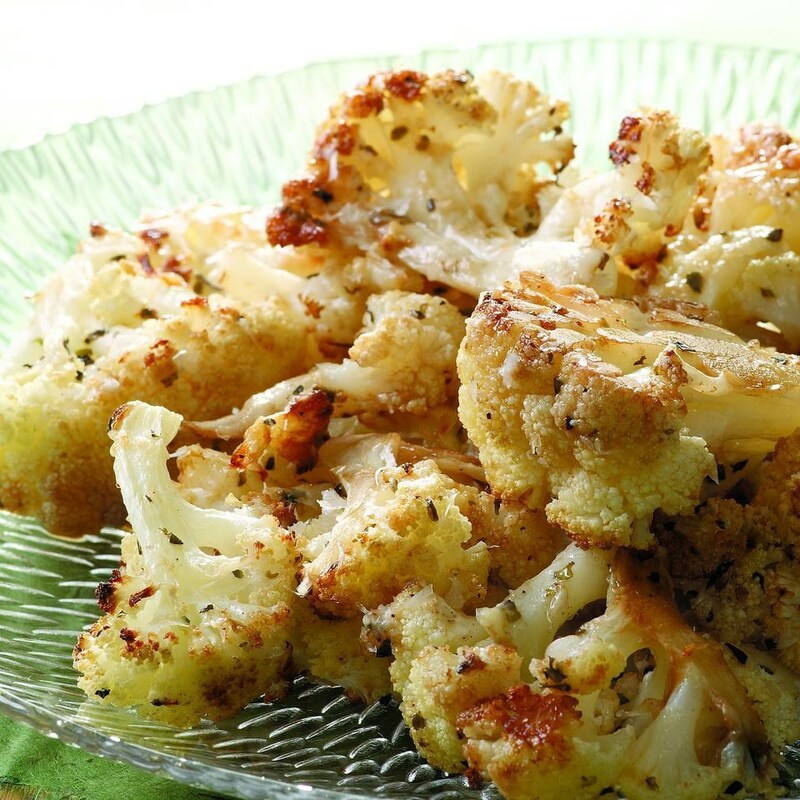 You can add aromatics like garlic or onion with the cauliflower. Once it's crisp-tender, you can stir in herbs or spices to add a bit of flavor before serving. 2. Place prepared cauliflower head in a medium cast-iron skillet. 3. In a small mixing bowl, combine oil and your preferred seasonings. Using a pastry brush, coat the cauliflower head with the oil mixture. Flip the cauliflower head upside-down, and pour the remaining oil mixture into the cauliflower head. Rotate to distribute evenly. 4. Flip the cauliflower upright in the skillet. Roast until tender-crisp, 35 to 45 minutes. A knife will easily pierce the thickest part of the cauliflower when it's cooked. Boiling cauliflower makes for a quick side, but boiling it in chicken stock or other soup base is a great way to tenderize the vegetable while you're preparing it for a recipe. You can puree boiled cauliflower with an immersion blender to add body and creaminess to soups without upping calories or fat from cream. You can also boil cauliflower and mash it with a fork or potato masher for a lighter "mashed potato" side. 3. Drain the cauliflower. Toss with oil and preferred seasoning. 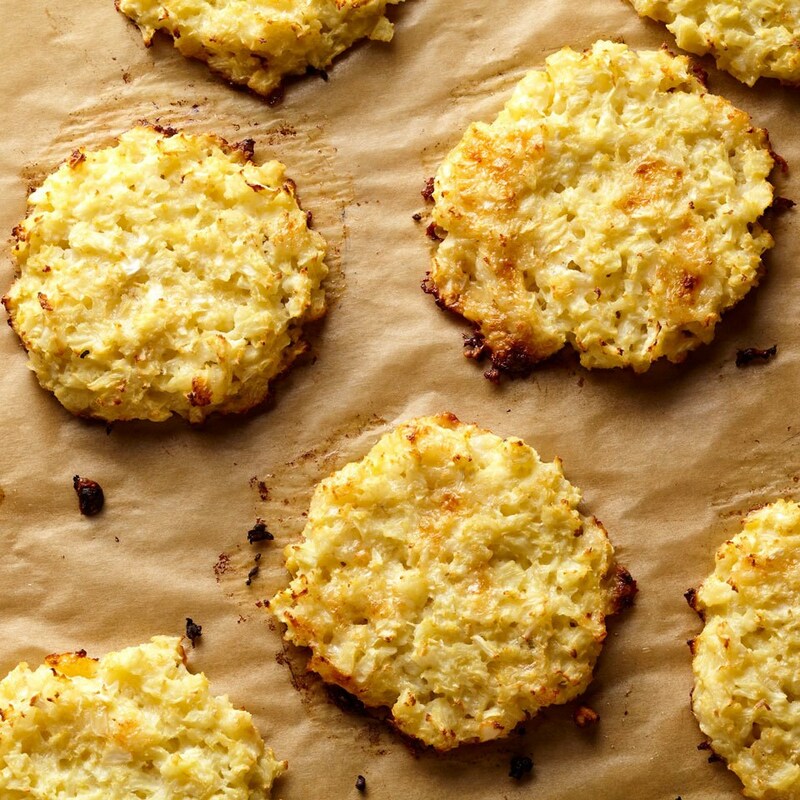 Cauliflower makes a healthy vegetarian replacement for some chicken recipes. A popular method is to coat roasted cauliflower with Buffalo wing sauce for a meatless version of Buffalo chicken wings. 1. Roast cauliflower florets in a hot oven until browned and crispy. 2. While the cauliflower is roasting, prepare your Buffalo sauce. 3. Toss the roasted cauliflower in the sauce and serve with classic accompaniments: ranch dressing or blue cheese dip and cut-up carrots and celery. 1. Start with a whole cauliflower, leaves removed. Trim off the woody end of the stem. 2. Using a large chef's knife, slice the center of the cauliflower into 1/2- to 3/4-inch-thick slices. A large head of cauliflower will produce 3 to 4 cauliflower steaks. The ends will crumble into florets. Save these for another recipe. 3. Place the steaks on a baking sheet coated with cooking spray. Add preferred seasoning. 4. Roast at 450°F, gently turning halfway, until browned and crispy, 25 to 35 minutes. Read More: How to Turn Cauliflower into a Juicy "Steak"
Cauliflower are crucifers, part of the Brassica family. That makes them close cousins to broccoli and not far removed from cabbage, Brussels sprouts and similar leafy green vegetables. Standard white cauliflower is great for making cauliflower "rice" and "mashed potatoes," but also be sure to look for colorful options like purple, orange and lime green. These cauliflower varieties have the same nutty and delicately sweet flavor as white cauliflower. If you're buying a whole cauliflower head, look for one that is compact, with tightly packed buds. Large gaps are a sign the curd may be crumbling. Avoid any that have brown spots or areas of dull color. That's a sign of moisture, and the cauliflower may go bad more quickly. Leaves should be fresh and vibrant green. If you're buying precut cauliflower, look for florets that are creamy white without any brown or yellow spots. Because they're already broken down, these convenience foods need to be used within 2 days of purchasing. If you don't plan to cook cauliflower right away, store it in a plastic zip-top bag stem-side up to prevent condensation. Moisture will speed up deterioration. Properly stored cauliflower will last 5 to 7 days in the refrigerator. One cup of cauliflower florets has just 28 calories, 0 grams of fat, 6 grams of carbohydrates, 2 grams of protein, 2 grams of fiber, 18 milligrams of sodium and 176 milligrams of potassium. Cauliflower is also a rich source of vitamins C and K, and it's chock-full of cancer-thwarting compounds that can fight free radicals. Orange cauliflower, one of the colorful cauliflower varieties, is also a good source of beta carotene (you can find it in carrots too), so it's good for helping boost the immune system and promote eye health. Cauliflower is the ultimate carb replacement. Because it mimics both the texture and flavor of some starchy sides like rice and potatoes, it can stand in for a number of carb-rich foods, from pizza crust to potatoes, pasta to biscuits. Cauliflower is also a great pretender. When it's roasted, it turns brown and crispy like fries. When it's steamed and mashed, it makes for a fine mashed potato alternative. Chopped into bite-size florets and tossed with Buffalo sauce, cauliflower can even be a convincing chicken substitute. One cup of cauliflower has just 28 calories compared to 218 calories in the same amount of brown rice. Plus, 1 cup of cauliflower has about 6 grams of carbs compared to rice's 46 grams. Cauliflower is a cool-weather crop. Depending on location and climate, it's primarily harvested twice a year, in spring and fall, when cooler temperatures help it grow evenly. The peak season is late summer through late fall, when the hottest days have passed and before frosts become a factor. Cauliflower is temperamental, and it prefers to grow where cool temperatures are consistent. Hot spikes can make the plant bud too quickly, and frosts can kill it before it has a chance to grow. If you decide to try your hand at growing this Brassica, set out spring plants two to four weeks before the last frost. If growing in the fall, set out fall plants six to eight weeks before the first anticipated frost. Keep the plants 18 inches apart in the row, and sow rows every 30 inches. Water steadily and apply nutrients to keep the soil rich. When the cauliflower heads are about 2 inches in diameter, pull the leaves over the budding curds. If they need help, you can use a clothespin to hold the leaves in place. Harvest when the heads are between 6 and 8 inches in diameter.